England's path to Poland and Ukraine next summer looked to be a smooth one as goals from Ashley Young and Darren Bent gave them a comfortable lead after 31 minutes. But England's final qualifier, played out in the hostile surroundings of Podgorica City Stadium, turned on two incidents that will have cast a cloud over Capello's delight at reaching another major tournament. Elsad Zverotic gave Montenegro hope with a goal with the last kick of the first half - and when Rooney was deservedly shown red by referee Wolfgang Stark, England were placed under pressure they could not survive. Just as the clash entered stoppage time Dzudovic crossed for Andrija Delibasic to head in at the far post for a goal that gave Montenegro the point that puts them into next month's qualifying play-offs. Rooney's sending off will be the main talking point, however, and his actions once again raise questions about his temperament that he looked to have gone a long way towards answering in recent times. The Manchester United striker's explosive response to a block from Dzudovic was a complete over-reaction and the consequences quickly dawned on Rooney as he made his way off. England and Capello can now make plans for Euro 2012, but they will be without Rooney for at least the opening group match and perhaps more should Uefa decide to increase his suspension. Capello warned his players that caution was not an option as they went in search of the result that would take England to Euro 2012. And his message was carried out to the letter in the opening exchanges as England played with a tempo and threat Montenegro struggled to subdue. And with the sting drawn from Montenegro's gifted attacking players and thunder and lightning crackling around the small but atmospheric arena, England's rain-soaked fans were celebrating a second goal after 31 minutes. Bent was again left with the simplest of finishes when Rooney picked out Young and he unselfishly crossed for Bent to tap in from inside the six-yard area. Even then the perfectionist Capello was not happy, almost dancing in his technical area in fury when Gareth Barry wasted possession, constantly urging England to maintain the tempo that saw them take such a measure of command. Just as a satisfactory 45 minutes looked to be drawing to a close without further incident, England conceded a sloppy goal with the last act of the half. Fatos Beciraj was allowed time and space to find Zverotic, whose shot took a crucial deflection off Gary Cahill's boot and out of Joe Hart's reach. Capello made a change on the hour which was presumably enforced by injury as the excellent Young was replaced by Stewart Downing. And four minutes later Bent went off to allow Frank Lampard to come on and restore England's earlier midfield superiority. As England attempted to steady the ship, the Rooney flashpoint occurred 17 minutes from time. He was involved in little more than a routine battle for possession near the touchline before lashing out at Dzudovic. 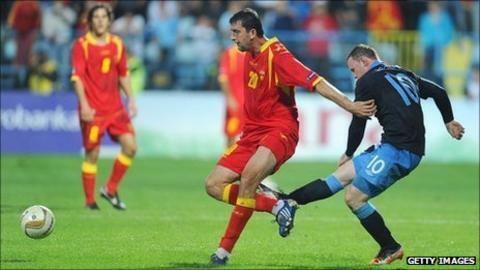 Dzudovic made the most of the offence but Rooney could have no complaints when he was shown a red card. The final twist came with that late equaliser. The final whistle brought celebrations from both sets of fans - but utter dejection for the tormented Rooney.